Buln Buln is on the Old Sale Road, the original Gippsland track that led from the present Princes Highway at the Robin Hood Hotel. The village thus predates the regional centres of Drouin and Warragul which formed along the railway line. Farm settlements along the Old Sale Road began in the 1870s. Brandy Creek, a few kilometres west of Buln Buln was the first village, and families at Buln Buln sent their children to the Brandy Creek school (1874) until they got one started in the village hall in 1878. A proper school building was constructed in 1884 and the present building dates from 1909. 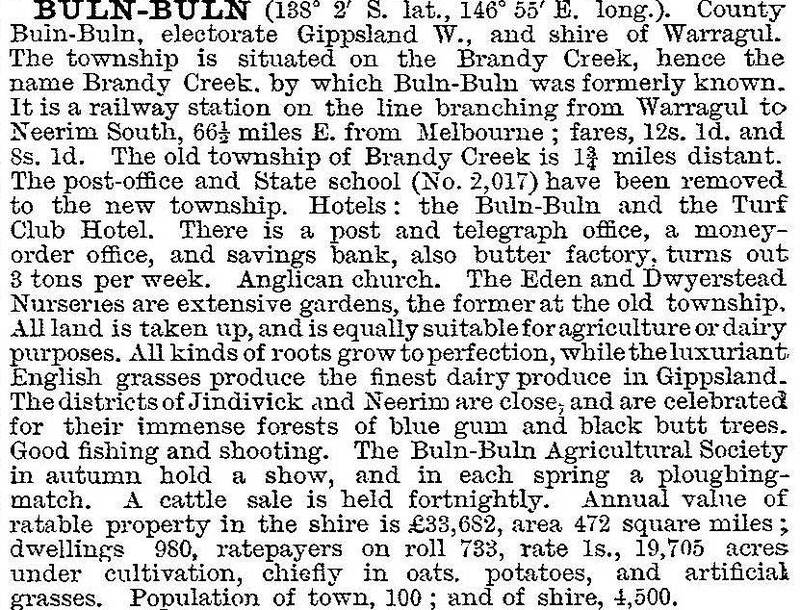 In 1911 the Victorian municipal directory recorded two churches and two hotels at Buln Buln; Sands and McDougall’s directory also recorded a storekeeper, a baker, a blacksmith and over 50 farmers (mostly dairy). Proximity to Warragul caused the decline of most of the non-farm enterprises. The railway closed in 1958, and the station site was acquired for a recreation reserve (1977). The approach to Buln Buln is marked by an avenue of honour (elms) on the side of Old Sale Road, passing by the recreation reserve and the well preserved school (162 pupils, 2014). The Anglican/Uniting church is in Station Street.